Since the supermarket shelf today represents the prime source of wines for consumer purchase, the same rules of shelf ‘stand out’ apply as for other retail products. It is of paramount importance to ‘make the brand speak, and, while wine packaging as a whole -- from glass bottle to bag-in-box, carton, and pouch -- is a highly-active field of endeavor, the prime contributor to high-visibility shelf appeal remains… the simple wine label. According to the newly-published AWA Global Wine Label AWAreness Report 2016, the market for wine labels across all formats is forecast to grow by 2% between 2016 and 2018, reflecting increasing levels of wine production around the globe. However, growth in global wine consumption is challenged by the increasing popularity of other alcoholic beverages – particularly craft beers and some spirits – so the incentive to raise the level of visual appeal of wine labeling and packaging remains strong. 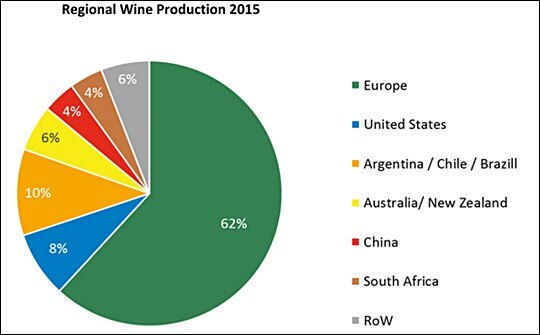 Europe claims the major share of global wine production, at 62%, with the wine-growing countries of South America – Argentina, Chile, and Brazil – in second place with a 10% share, and the US third with 8%. These three regions also dominate the use of wine labeling materials. Overall, as AWA research shows, the wine producers still prefer traditional paper label substrates over film substrates. Pressure-sensitive labels continue to capture market share from traditional glue-applied labels, with over 60% of total usage, and are forecast by AWA to grow at 2.8% per year in 2016 to 2018). Their dominance reflects the sophistication and variety of printing/converting technologies – particularly for shorter runs and complex diecutting – and the efficacy of automatic label application. Glue-applied labels, with a 36% share, will also grow fractionally, while the ‘newcomer’ technologies, sleeve labels, will increase their current small share by a massive 7.1% per year over the same period. The new report provides in-depth information on the structure of the global wine market, on the key regional producers, and on the product decoration technologies, concluding with a company directory spanning label material suppliers and converters, wine producers, and wine resellers. This fifth edition of provides a focused, practical, and concise assessment of the wine label value chain, delivering timely and accurate information about the market, trends, and opportunities for the future. For more info visit: www.awa-bv.com.